Some of the first sailors to disembark HMCS Ville de Québec make their way down the gangway to meet friends and family. 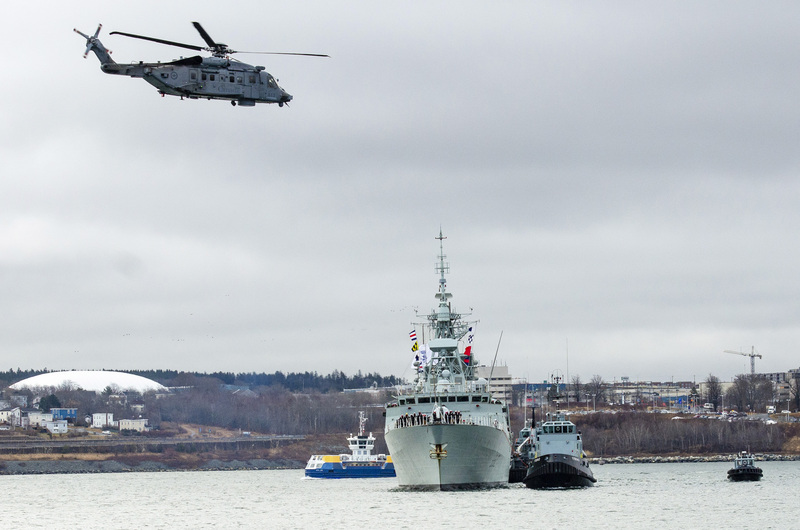 The same CH-148 Cyclone that accompanied Ville de Québec on its six-month deployment provided a flyover as the ship approached HMC Dockyard for its return home. 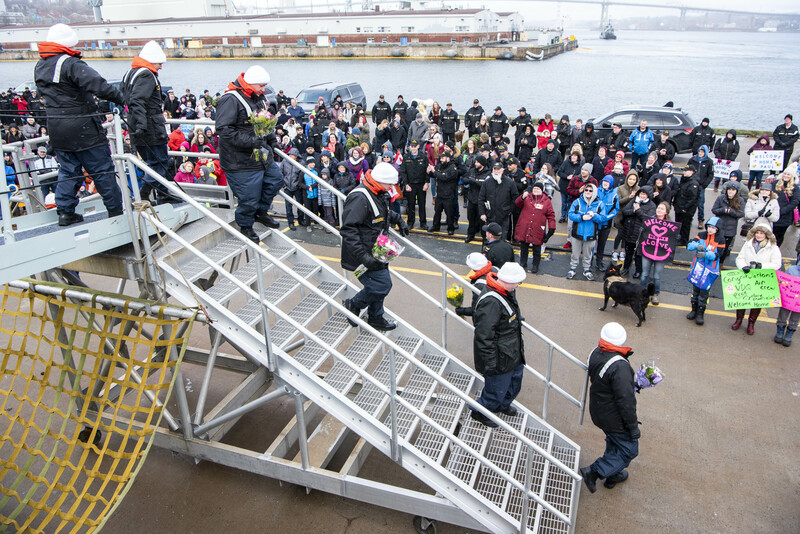 After 190 days at sea and nearly 33,000 nautical miles sailed, HMCS Ville de Québec made its triumphant return home on January 19, with about 250 personnel ready to start the new year with friends and family after a long deployment. 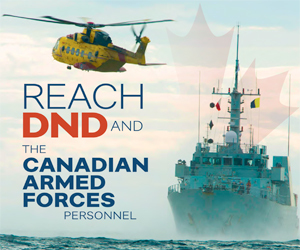 The ship was participating in Operation REASSURANCE, which is Canada’s contribution to NATO assurance and deterrence measures in the Mediterranean sea. The six-month sail included a number of operational patrols as part of Standing Nato Maritime Group 2 (SNMG2), interoperability training with partner navies, and participating in NATO exercises, including TRIDENT JUNCTURE in Norway, NATO’s largest multinational exercise in years. “I am incredibly proud of the hard work and accomplishments of the crew of HMCS Ville de Québec over the past six months. Since deploying in July 2018 as part of Operation REASSURANCE, we conducted highly effective patrols and participated in key NATO exercises in the Atlantic Ocean, the Mediterranean, and the Norwegian and North Seas,” said Cdr Scott Robinson, the ship’s Commanding Officer. And hundreds of those family members were anxiously awaiting the ship’s arrival at the jetty on the cold morning, with plenty of hugs, kisses and tears to go around as members of the crew began disembarking. The traditional first kiss lottery was won by MS Scott Chatterton, who was met on land by his wife Erin Dawe and his son Clarence. “It was a good trip, but I’m happy to be home,” MS Chatterton said to reporters on the jetty. Op REASSURANCE deployments in the Mediterranean have been continuous for the RCN since 2014, with the NATO mission serving as a response to Russian actions in Ukraine at that time. This tenth rotation, however, had the added significance of being the first operational deployment for Canada’s new maritime helicopter, the CH-148 Cyclone. Ships that previously deployed on Op REASSURANCE were accompanied by Sea King helicopter crews. “We’ve had a chance to bring this modern tool to the fleet. It’s the job we’ve been doing for years, but now we get to do it with equipment that’s delivering real new capabilities to the ship,” said Maj Erik Weigelin, the Commander of Ville de Québec’s Helicopter Air Detachment. His crew was able to begin integrating the new aircraft with the Halifax-class frigate during the trip, as well as validating the interoperability of the new equipment with NATO allies and other partners at sea. They also began refining and improving existing tactics and procedures to fit the Cyclone’s advanced technology and capabilities. In total, the 21-person Cyclone crew flew 185 sorties through the deployment, accumulating 525 hours of flight time. 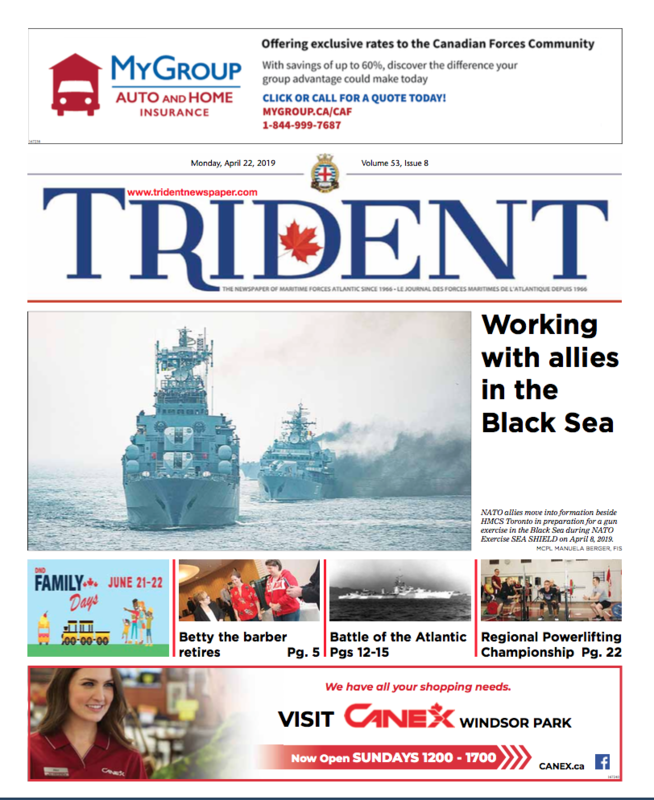 “This deployment marked a historic moment for both the Royal Canadian Navy and Royal Canadian Air Force,” Cdr Robinson added. Ville de Québec’s replacement on Op REASSURANCE, HMCS Toronto, departed Halifax on January 19, along with its own Cyclone crew, and has already joined NATO SNMG2 allies in the Mediterranean.